We have been submitting our releases to Il Cinema Ritrovato DVD Awards for many years. Milestone is a company — it’s just my wife Amy Heller and me, to be specific — entirely devoted to the restoration and distribution of “lost” cinema: films that have been forgotten by audiences, critics, academics and sometimes even the archives themselves. Most are directed by women, filmmakers of color, those in the LGBTQ community, and usually of subject matter not represented by traditional Hollywood. We are restoring fifteen films this year, which is a lot for us and a large financial risk. We know there are very few organizations that promote the kind of work we do. Il Cinema Ritrovato, both in its festival and these awards, is the best of them. 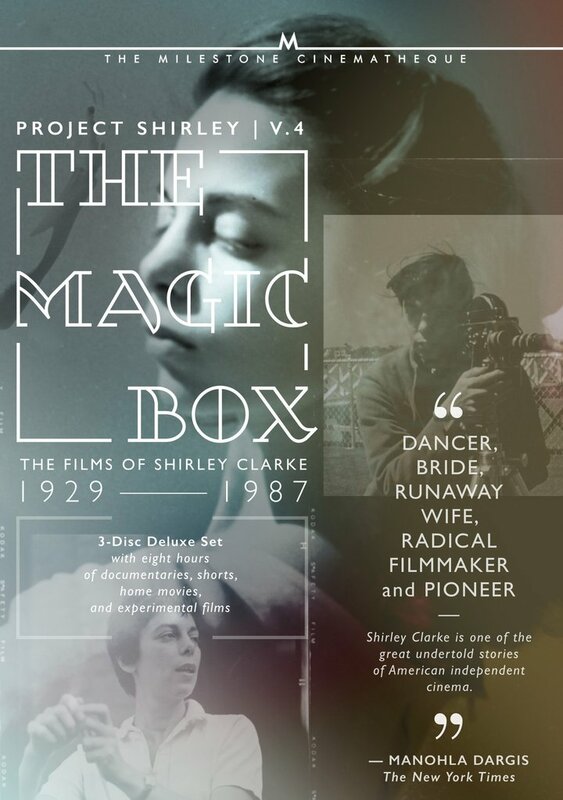 We have already won an Il Cinema Ritrovato DVD Award in 2015 for Project Shirley Volumes 1-3, so I suspect this year’s entry has little chances of winning, but The Magic Box: Project Shirley Volume 4 is such a unique release that I wanted to enter it anyway. 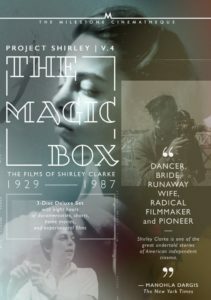 Shirley Clarke was not only one of the great independent directors of the 20th century, but also one of the most enigmatic. There are no biographies, documentaries, or any real investigation into her work. Luckily, with the help of the Wisconsin Center for Film and Theater Research, we had complete access to almost every film she ever worked on — including a large number of never completed work and experiments — as well as her family’s home movies starting when she was nine years old. From Shirley’s daughter, Wendy Clare, we were able to borrow four volumes of family photos dating back to the 1890s when the Brimberg family was still in Russia. Therefore, we were able to not only create an almost complete overview of her brilliant work, we were able to create a personal and artistic diary of almost her entire life. With how many other filmmakers do we have this opportunity? This particular 3-disc volume took eight years to research, restore/digitize, organize, and produce. In many ways, it’s the best release we’ve ever produced. So yes, we definitely wanted to submit THE MAGIC BOX to the DVD Awards! For the first time in many years, a sizable part of our income is coming from streaming, particularly from Turner Classic Movies’ Filmstruck. There are also hundreds of other companies around the world that are seeking the rights to our titles for SVOD. So the writing is definitely on the wall. However, we pride ourselves in doing the years of research for each film, finding the bonus features that put our films into context, and create learning tools for professors and their students to better understand our films. I think most of the companies that do this — such as Criterion, the BFI, Flicker Alley and the rest of our ilk — find this to be the artistic side of film distribution. So there are selfish professional reasons why I hope Blu-ray and DVD distribution will last. As a lover of great cinema and a collector of discs, there’s also selfish personal reasons as well. I love to see what is being produced by the other companies!